Diageo Global Travel Retail has launched a new premium liqueur that combines cognac with the fine spirit and cream of Baileys. Baileys XC is exclusive to travel retail and will exclusive to Gebr. Heinemann until May 31. Baileys XC heralds an innovation in drinks alchemy, the company says. The XC stands for ‘exceptional cream’ in this luxury blend. The liquid is smooth and indulgent, offering a new taste experience for the liqueur category. Reco gnising the popularity of Cognac as a luxury spirit in travel retail, Baileys XC gives travellers a new premium product which cannot be purchased elsewhere. Baileys XC will be launched across all key travel retail markets from June 2016, following the exclusivity period with Gebr. Heinemann. 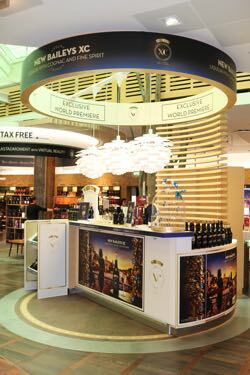 Pop-up retail experiences, retail furniture and display units, featuring chic Parisienne styling have been designed to allure shoppers into the sophisticated world of Baileys XC. These activations will be rolled out across key airports as part of the launch activity. Baileys is the world’s first Irish cream liqueur, a unique blend of smooth Irish cream with quality spirits and whiskey. It’s the number one liqueur brand in the world, with over 70 million bottles sold across 150 countries each year.